The destinations of Bangkok and Pattaya are a couple’s daydream. The wonderful Thai destinations with their never ending appeal are here to woo couples from all over the world. Bangkok Pattaya Tour package takes travelers across the spotless beaches, pristine waters, tropical jungle, and fascinating culture. Then there are the shopping malls, ancient temples, monuments, wildlife sanctuaries, and the magnificent aura that never fails to cast a spell on its visitors especially those on their honeymoon. The lovely honeymoon destinations of Bankok, Pattaya along with Phuket, Krabi, and Koh Samui make Bangkok Honeymoon Package a highlight for couples. Moreover, the international airports at Bangkok, Phuket, Krabi, Koh Samui, with flights from major Indian destinations including Delhi, Mumbai, Chennai, and Kolkata ensures couple from various parts of India can fly in to spend a great honeymoon in Bangkok and Pattaya with their better half. The best time to visit Bangkok and Pattaya for a honeymoon is from November – March. During this time, the weather is more pleasant and perfect for a vacation. The months of April and May are extremely hot, however June – October brings in a lot of rainfall, which hinders water sport activities and boat rides. So, if you are looking for some best deals on Bangkok tour packages from Delhi, Bangalore, Mumbai, Chennai, or Hyderabad, then book your escape now with HoneymoonBug and set off on your romantic escape with us. Why Book your economical honeymoon packages to Bangkok with us? 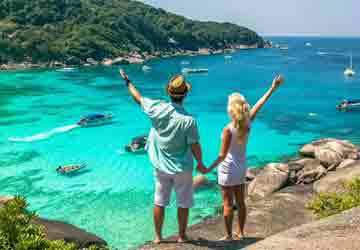 With Bangkok Pattaya tour Packages you can relish an ultimate honeymoon experience at the best destinations of Thailand with your beloved on your romantic escape. 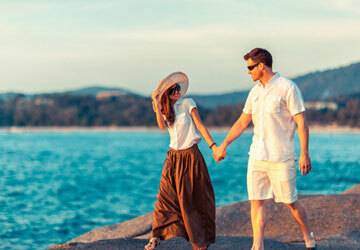 From shopping at the night markets, dancing it off at the beach parties to a splendid day at the beachside, you have got a multitude of ways to make the most out of your escape with honeymoon tour packages for Bangkok Pattaya. •Best international honeymoon tour packages to major destinations. What are the most famous honeymoon destinations in Bangkok Pattaya? 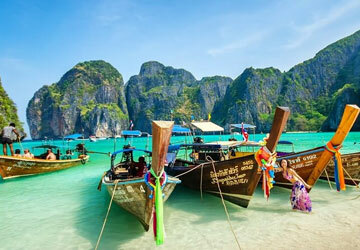 Two of the most popular highlights of Thailand, Bangkok and Pattaya promises a great holiday to couples. From the best cosmopolitan amenities to cultural tours, Bangkok and Pattaya honeymoon packages have it all packed up in a single itinerary. The destinations host a number of world famous attractions, which helps couples to create happy memories in each other’s company, which can be treasured for the rest of their lives. Perched off Thailand’s gulf, Pattaya is home to sparkling blue beaches with crystal clear waters, a perfect place to enjoy a sun-soaked morning or a breezy evening with your beloved. Also, these sun-kissing beauties are famous for their colorful coral reefs and holds great opportunities for adventure sport activities. The famous points of interests to discover on your Pattaya sightseeing tour includes Sanctuary of Truth, Nong Nooch Tropical Garden, Pattaya Floating Market, walking Street, Wat Phra Khao Yai (Big Buddha Hill), Coral Island, Art in Paradise, Ripley’s Believe it or not, Khao Chi Chan (Buddha Mountain), and others. Also, the famous Tiffany Cabaret Show is a must see for couples in Pattaya. The city of temples, limitless shopping destinations, and a vivid nightlife, Bangkok is a dream destination, also known as the ‘City of Angels’. The must-see attractions of the city are Grand Palace & Wat Prakeaw, Wat Arun, Floating Market, Yaowarat (Chinatown), Wat Pho, Chao Phraya River, Chatuchak Weekend Market, Soi Cowboy, Jim Thompson’s House, and Safari World, etc. Moreover, the city’s restaurants, local food vendors, and eateries are also a highlight of the city where couples can relish the famous delicacies and cuisines of Thailand. What are the things to do in Bangkok Pattaya on Honeymoon? What to Buy in Bangkok Pattaya? During their honeymoon in Bangkok and Pattaya couples can relish a great shopping spree. While Bangkok is home to the world’s largest shopping, Pattaya introduces shoppers to its famous floating markets. So, if you are a compulsive shopper and would love to bag in some great stuff during your honeymoon, then here are the top things to buy in Bangkok and Pattaya. How to Reach Bangkok Pattaya By Flight? Bangkok and Pattaya can be reached from major Indian cities like New Delhi, Mumbai, Kolkata, Trivandrum, and others via active flight services. Couples can visit Bangkok Pattaya with Bangkok Pattaya tour packages throughout the year. Established in 2017 and growing stronger. Over 5 thousand delighted customers & still growing. Thank you Honeymoon Bug for this amazing Honeymoon Tour to Bangkok and Pattaya. We really had a great holiday and the destinations were simply the best. We would personally like to Thank Mr. Rakesh who was constantly available on phone throughout our trip to make sure we were having a great time on our honeymoon. Really Thanks a lot. Thank You Honeymoon Bug for this great Honeymoon trip to Bangkok and Pattaya. Everything was planned according to our travel plans. Also, our tour advisor Mr. Rakesh was very helpful and always ready to listen to our queries and responded at the earliest. It was really a great experience and we loved our honeymoon tour.